What makes a rescue group different from a shelter? Most shelters have a main facility that accommodates a large number of dogs. They are usually run by city or county governments and will euthanize animals due to lack of space, health issues, or when the animal has been there for a certain amount of time. Rescue groups generally rely on volunteers and foster families to care for their adoptable dogs until they find forever homes. They are run by caring people and they do not euthanize their animals, unless out of compassion. From where do you rescue your dogs? Our dogs are rescued from high-kill shelters in California, Washington, and Oregon. We also accept owner-surrenders on a case-by-case basis. How do you choose your dogs? Our dogs are chosen based on their temperament, urgency, and/or occasionally to fulfill an adopter’s request. Do you only rescue Rotties? 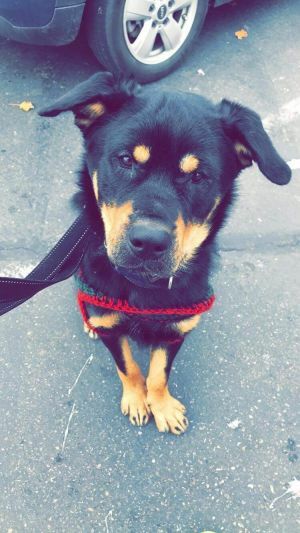 We do love our Rotties and Rottie mixes, but we also rescue dogs of all breeds and sizes. Do you only rescue dogs? We also rescue cats. In the future, we hope to open our doors to pocket pets and even reptiles/amphibians. We accept owner surrenders on a case-by-case basis – preferably with proof that the dog is current on vaccinations, and is neutered/spayed. We also complete an evaluation to ensure he/she is adoptable to other individuals or families. Where are you located? Do you have a facility? We are based in both Eugene, Oregon, and Los Angeles, California. The Heart of Rescue relies on its volunteers and foster families to house and care for available dogs. Our fosters span from Southern California to Southern Washington. Where do I go to see the dog(s)? We are happy to arrange a meet-and-greet between you, your family, and the dog(s) in which you are interested. Usually our meets take place in Eugene or Portland, Oregon or Los Angeles, California area. It will depend on the location of the dog(s) you are interested in. We ask that all members in your household, including any other dogs you may own, be present to ensure compatibility. Please complete an application on our website, and we will call you for an interview, prior to arranging a meeting. If you live a distance away, a home visit prior to a meet may be recommended. Adoption fees vary, depending on breed and age. Generally, fees range from $200 to $400. Kittens and cats are adopted at a fee of $100-125. What can I expect when adopting a rescue dog? Your new family member will require your patience, consistency, and time in getting adjusted to his/her “furever” home. It can sometimes take months to adjust to new surroundings and may require the help of one of our trainers. We are looking for committed adopters willing to work through any issues that develop. We offer plenty of helpful advice and support- day or night. Create a routine that your dog can depend on. Build trust by spending quality time exercising, nurturing, and learning about your dog.